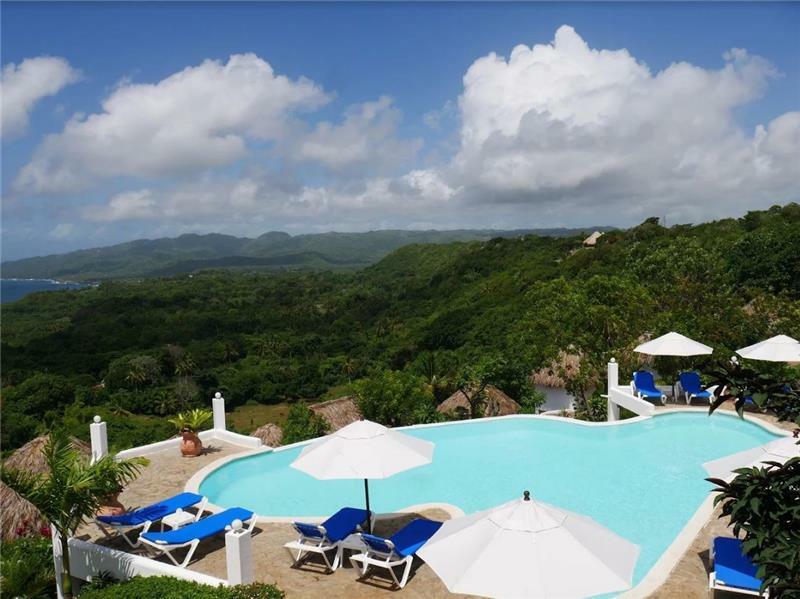 Samaná Ocean View Eco-Lodge is a property with 14 cottages, infinity pool and spectacular ocean views, which can be rented exclusively (no booking per room possible) and accommodates up to 28 guests. The Lodge is operated by Dominican Expert and is perfectly suited for families, small groups, friends, weddings, team building events and incentive trips. Those staying here can enjoy the tranquil surroundings and the beautiful nature of the Samaná peninsula, one of the highlights of the Dominican Republic. The property was recently completely refurbished and has reopened its doors in 2016. Each cottage offers absolute privacy and a terrace or floor-to-ceiling window with perfectly stunning ocean views. Thanks to the new infinity pool, the 24-hour villa manager, a meal service on request and an optional private chef and bartender, Samaná Ocean View Eco-Lodge offers the same services as a hotel, but with much more exclusivity and tranquility. 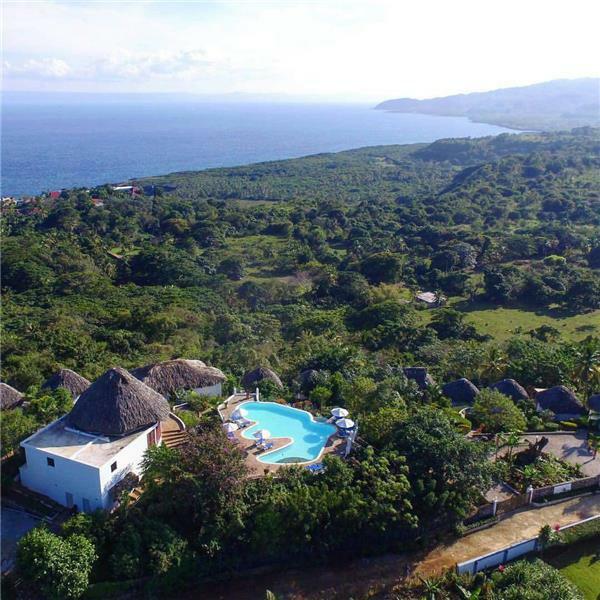 Due to its stunning setting on a hilltop, we recommend that you rent a car, minivan or bus (we are more than happy to organize this) for easier access to the beautiful surrounding area of the Samaná peninsula. During the months of January, February and March you can watch the migrating humpback whales directly from the Samaná Ocean View Eco-Lodge. There is also a more than 1000ft² sized seminar and yoga area with incredible ocean views available. 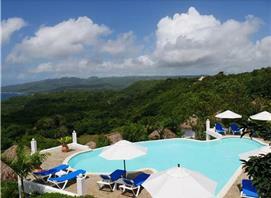 The property is located on a hilltop in La Guázuma, close to the quaint fishing village of Las Galeras on the Samaná peninsula. Samaná is usually rated as the most attractive region in the Dominican Republic with endless groves of palm trees and pristine deserted beaches. Two of the most idyllic beaches in the world, Playa Frontón and Playa Rincón, are 10 and 15 kilometers away. A Colmado, one of those typical mom and pop shops of the Dominican Republic, is about 800 meters away, and a French restaurant about 2 kilometers away. The driving time to the El Catey Airport (AZS) of Samaná is around 1 hour, to the Las Américas Airport (AZS) in Santo Domingo is 3 hours. Queen-size bed (1 cottage has a king-size bed) with bedding, bedside tables, night light, chairs, table, ceiling fan, closet, room safe and a bathroom with shower. All of the cottages have perfectly stunning ocean views on the Samaná peninsula - 6 of them from the cozy balcony, the other 8 through the fully-openable picture window (among them 2 with an outside terrace accessible through the front door). The rooms are cleaned twice a week or, upon request, every day. The club house comes with a sound system, free Wi-Fi, barbecue, and a large and fully equipped kitchen, which can be used for big events or weddings as well. The terrace of the club house comes with a large living and dining area, a bar, a separate refrigerator for drinks, and fantastic ocean views. Sun chairs, sun shades and an outdoor shower are available at the pool, which can be used 24 hours a day and will be illuminated at night. There is no air-conditioning (as it is not needed) or television on the property. A private chef, waiter and bartender can be provided for a fee. Individual meal plans are available, be it one or three meals per day, buffet, or plated. For those who prefer to cook themselves, a shopping service can be provided. An exclusive catering service with gourmet options for private groups (starting from 8 guests), events and weddings is also available upon request at the Samaná Ocean View Eco-Lodge. Meal plan prices only valid starting from 6 persons. For a lower amount of guests please enquire separately. Prices include a private chef, shopping, service, preparations, cooking and cleaning. It's possible to book the meal plan for individual days or for the entire stay. When booking the bartender option, drinks are not included. They can be obtained locally through our shopping service (20 USD per cart + sum of groceries) or by buying them individually in the supermarket.